Welcome to the Wild Wood Disco, a one night al fresco party with plenty of dancing and revelry under the canopy of the trees. 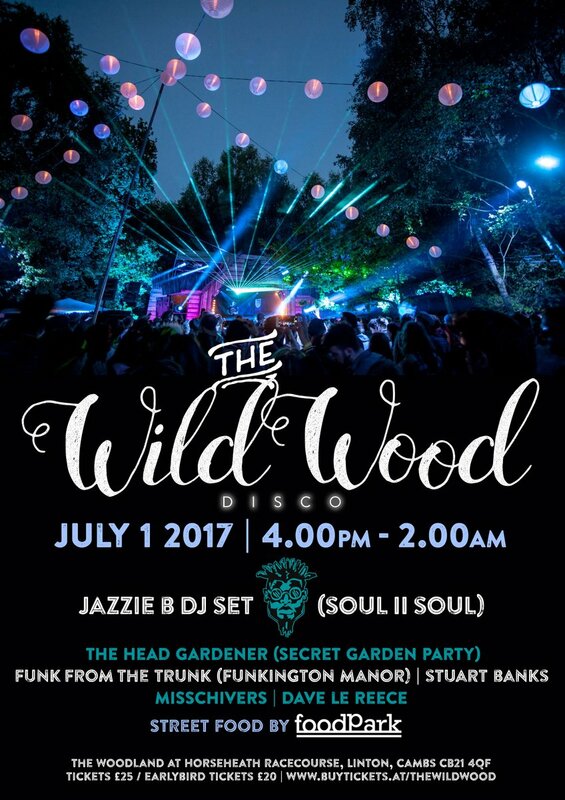 Music is the main attraction – we’ve got the best DJs gracing our Woodland stage, spinning funk, disco, soul, house and dance music. Expect to be seduced by magical lasers, colourful lanterns, art installations, LED hula hoopers, loads of glitter, crazy entertainers, hidden bars and and plenty of magical things to discover deep in the woods. The Wild Wood will be brimming with bars, including a Prosecco on tap bar, the Horsebox cocktail bar, a Craft Beer Bar and our very naughty absinthe hut will be making a special re-appearance. The best of Cambridge Street Food comes courtesy of Food Park, we’ll have everything from Asian Bao buns to Hot Churros . (Full trader line up to be released soon). Jazzie B DJ set – Soul II Soul legend Jazzie will be gracing the decks playing a host of old school funk and soul that he knows so well. Jazzie works as a music producer, has collaborated with the greats – even James Brown, and has an OBE for his services to music. The Head Gardener – We’ve danced many times before to his dreamy, up-lifting house tunes under the trees at Secret Garden Party. We love his DJ sets! Funk From The Trunk – Bristol DJs that mix a mean lot of funk. These guys run club nights called Funkington Manor which have toured at festivals, such as Boomtown where they really rocked it! We can’t wait to get down and funky in the forest to these guys. Dave Le Reece – A DJ and promoter on the Cambridge circuit for many years from the infamous Good Times to The Day Release super disco. Dave plays nu-disco/house/acid house/ nu-funk / soul/. The Star & Mouse Picture Show – screening something magical in the woods. Food Park Line up – Buffalo Joes, Kura Kura, The Tin Kitchen, Holy Schnitzels and The Churros Bar. Cash- Bring cash with you for Food Trucks and Bars, there are no card payments anywhere on site. Parking – is free. Cars can be left over night and collected the following morning. Camping – is £10 per person. We have minimal camping facilities, just a field and toilets and are allowing a restricted number. Add camping ticket to your ticket purchase at the check out. Camper Vans – £20 per vehicle. No alcohol onsite that is not purchased at one of The Wild Wood bars.